Wood is an important construction material, but when used incorrectly it can be subjected to deterioration by wood-destroying fungi. The brown rot producing dry rot fungus (Serpula lacrymans) is by far the most dangerous wood-destroying fungus in Europe. In the present publication, 645 fungal samples from damaged wood in the federal state of Styria (Austria) were examined and recorded by isolation date, geographical location, species identification of the wood-destroying fungus, location of damage, construction method, and age and type of building. In Styria, Serpula spp. accounted for 61.5% of damages, followed by Antrodia spp. (10.7%) and the genera Gloeophyllum (8.2%), Coniophora (3.9%) and Donkioporia (1.1%). Properties in the area of the Styrian capital Graz and old buildings were more often infested by wood-destroying fungi than houses in the rural area and new constructions. Wood rot is the degradation of wood by the destruction of organic materials caused by fungi. This process is predominantly affected by temperature and moisture as well as the durability of wood material (Krzisnik et al. 2018). Wood decaying fungi can be divided into brown rot, white rot and soft rot. Up to now, 120 different wood-destroying fungi in buildings have been identified in central Europe (Huckfeldt and Schmidt 2015). The fungus that causes the most severe damages to European buildings in service is the brown rot producing dry rot fungus (Serpula lacrymans), which was recently ranked as one of the world’s ten most feared fungi (Hyde et al. 2018). Wood still ranks among the leading construction materials in Europe because of its high load capacity, good thermal insulation, stability as well as low carbon footprint. However, when wood is not protected properly, insects and wood degrading fungi such as the dry rot fungus (S. lacrymans), the cellar fungus (Coniophora puteana), Antrodia spp. and other wood-destroying fungi can cause severe damage to buildings and potentially cause human injuries. Some wood-destroying fungi can penetrate even masonry and are able to translocate water and nutrition over long distances. Infestations of buildings with wood-destroying fungi can have different causes: contaminated construction wood, ingress of fungal spores into the building, or usage of fungus-infested timber. Precondition for the development of every fungal infestation is humidity, aerobic conditions facilitate the growth of wood-destroying fungi. Under appropriate conditions, fungal spores germinate and develop hyphae that colonize large areas. Infestations with wood-destroying fungi are often not recognized at an early stage because of the hidden nature of growth (behind wall paneling, under floorboards etc.). The mycelium continues to grow as long as there is enough nutrition available, thereafter, fruiting bodies are produced which form numerous spores. Adequate humidity and temperature are mandatory for the growth of wood-destroying fungi. Therefore, climatic changes may be an important factor for an increased occurrence. When a wood-destroying fungus has spread in a building, an accurate diagnosis of the nature of the fungus is mandatory for reliable estimate of the damage and proper renovation/restoration. Wood-destroying fungi can be substrate-specific species, which rely on certain wood, or unspecific, which can grow on different kinds of wood (Bavendamm 1969; Plank 1979; Schwarze 2007). In Northern Europe, mainly conifers are used as construction material. Hence, fungal species adapted to conifers like the genera Serpula, Antrodia and Coniophora are found to cause the majority of damages in buildings in this region (Schmidt 2010). According to Dämon et al. (2000), a variety of wood-destroying fungi occurs in the federal state of Styria, depicted in a mycological map of “Weststeiermark”. Maurer et al. (2009) conducted a mycological mapping of the montane and subalpine altitude zones of “Obersteiermark” and found 500 wood-destroying fungal species, S. lacrymans once from a disposed spruce board on a forest edge. In Styria, S. lacrymans is the most widespread wood-destroying fungus in buildings. Building-associated records (covering more than four decades) are present of almost all political districts of Styria (Mayrhofer 2006). The infestation of buildings with S. lacrymans is estimated in a scale of 1000–2500 incidents annually according to IBO (Österreichisches Institut für Baubiologie und Bauökologie, Austrian Institute for Construction Biology and Ecology). These numbers are subject to considerable fluctuations because of, for example, changing weather events or flooding. In the past, it was mandatory to report the presence of S. lacrymans to the authorities in Austria, but not at the present time (Kalcher 2004), whereas, for example, in Germany, a reporting obligation still exists in some states (Thuringia, Hesse, Saarland, Hamburg and Saxony). However, in the case of an infestation of a building with wood-destroying fungi there are regulations and norms in Austria dealing with compulsory measures for damage management and control strategies. The abatement and damage-abolition have to be performed by a specialized company based on an expert opinion (Behling 2004). In the case of wood-destroying fungi, there is the demand to differentiate between infestations by S. lacrymans and those by other wood-destroying fungi, because in the first case much more elaborate renovation measures are necessary. So far, there have been no reports existing on the prevalence and incidence of wood-destroying fungi in buildings in different regions of the federal state of Styria/Austria. The goal of this study was to provide an overview on the frequency of wood-destroying fungi in different buildings and construction categories for this region. From all 645 cases collected in Styria, fungal species, type of rot (brown or white rot), location of the damage, construction method, age (new: after 1945) and type of building (cultural monument or residential building, detached or apartment building), isolation date, place and geographical region were recorded. Fungi identified at the Institute of Hygiene, Microbiology and Environmental Medicine, Medical University Graz (IHMU), were collected and preserved as illustrative material and for documentation of the local biodiversity of wood-destroying fungi in Styria. Styria with its capital Graz is the second largest (16,401 km2) federal state in Austria, located in the southeast of the country, and around 61% of the area is forested. The north of Styria is alpine, the south mainly hilly and covered with meadows, pastures, crops as well as fruit orchards and vineyards. Styria is subdivided into seven regions and has more than 1.2 million inhabitants (01.01.2018, Statistik Austria 2018). The identification of samples was primarily done by macroscopic characteristics. In wood-decaying fungi, these are specific surface mycelia, strands and fruiting bodies. Particularly important features are size, color and consistency of the fungus, texture and decay pattern of the wood (cubical cracking), depth of hyphal penetration, and also type (brown rot, white rot and soft rot) and intensity of wood rot (Weiss et al. 2000). When macroscopic diagnosis was inconclusive, microscopic identification took place. Therefore, identification keys were used together with microscopy (Gistl 1946; Huckfeldt and Schmidt 2015). If morphological examination did not lead to an unambiguous result as was the case in 177 samples, molecular methods (PCR, sequencing of the ITS region of ribosomal DNA) were used (Gardes and Bruns 1993; Schmidt 2000; Högberg and Land 2004). Identification based on the sequence data was carried out using BLAST (http://blast.ncbi.nlm.nih.gov) and GenBank (http://www.ncbi.nlm.nih.gov/genbank). Altogether 645 damage surveys were collected. Thereof 296 samples were examined at the IHMU, and data of 349 damage cases were provided by other institutions throughout Styria. Among all diagnosed wood-destroying fungi, 74 genera and 40 species were differentiated (Table 1). The occurrence of wood-destroying fungi in the years before 1980–2016 is listed in 10-year intervals (Table 2). From 645 collected fungi, 397 (61.5%) were Serpula spp., followed by Antrodia spp. (69/10.7%) and the genera Gloeophyllum (53/8.2%), Coniophora (25/3.9%) and Donkioporia (7/1.1%) (Table 2). Based on the addresses of damage events, it is possible to show the distribution of wood-destroying fungi in the seven regions of Styria (Fig. 1). The highest number (342/53.0%) was found in “Steirischer Zentralraum” which also includes the Styrian capital Graz (273/42.3%), the lowest number in Liezen (22/3.4%). The frequency of wood-destroying fungi by region is listed in Table 3. Serpula spp. were by far the most prevalent wood-destroying fungi in Styria. There exist 397 (61.5%) records (395 S. lacrymans and two S. himantioides). In “Liezen”, S. lacrymans was found 14 times, in “Steirischer Zentralraum” 204 times, alone in the city of Graz 165 times. The “wild relative” of S. lacrymans, S. himantioides, was documented twice in the present study in “Südweststeiermark” and “Steirischer Zentralraum”. Strand mycelia or fruiting bodies of Antrodia spp. were found in 69 cases (10.7%) in Styrian buildings. From “Steirischer Zentralraum”, 36 cases were reported, among them 29 from Graz, whereby three different species (A. sinuosa, A. vaillantii, A. xantha) were identified. Antrodia spp. were also found in the hilly districts of “Oststeiermark” (5) and in the mountainous regions of “Obersteiermark” (13), whereby A. serialis was found as well besides the above mentioned species. Gloeophyllum spp. are widespread in Styria, 53 isolates (8.2%) were documented. They were found in the first place in “Steirischer Zentralraum” (36), whereby G. sepiarium was predominant in “Steirischer Zentralraum” and G. trabeum in “Obersteiermark”. Coniophora spp., mainly C. puteana, were documented 25 times (3.9%) in Styria, and one single specimen of C. marmorata was reported from an apartment building in Graz (“Steirischer Zentralraum”). The white-rot fungus Donikioporia expansa was found for the first time in Styria in 2007 in “Liezen”, since then D. expansa was discovered as well in other regions, in total 7 times (1.1%). Altogether 94 sites (14.6%) with other wood-destroying fungi were documented in Styria, mainly in “Steirischer Zentralraum” (47, Graz 34), “Obersteiermark West” (13) and “Obersteiermark Ost” (11). Fomitopsis pinicola, Coprinus parouillardi and Peziza varia were detected in urban areas in apartment buildings. Rhodonia placenta (formerly Postia or Oligoporus placenta) grew in the city of Graz (“Steirischer Zentralraum”), in “Obersteiermark Ost” in an historical building and in “Obersteiermark West” in a mountain hut. Resinicium bicolor was isolated in “Oststeiermark” and “Obersteiermark Ost”. From the wood-destroying genus Trametes, the species T. abietina was identified in urban areas, and T. trogii in “Obersteiermark Ost”. Leucogyrophana pinastri and L. mollusca were found once each in wooden huts. The prevalence of wood-destroying fungi in different buildings was grouped in these categories: old buildings (before 1945) and new buildings, cultural buildings and residential buildings, single-family houses and apartment buildings (listed in Table 4). Wood-destroying fungi were found more frequently in old buildings (530/82.1%) than in new buildings (115/17.9%). S. lacrymans occurred in old buildings 351 times (88.4%), in new buildings 46 times (11.6%). The substrate of the investigated wood-destroying fungi was mostly processed wood within infested buildings. Most of the fungi were isolated from wood in cellars and the roof, or from support beams and floors. The type of wood was above all spruce (Picea abies), oak (Quercus spp.) and pine (Pinus sylvestris). Figure 2 illustrates the location of the wood decaying fungi. Serpula spp., in particular S. lacrymans was found most frequently on or in floors and in cellar rooms (Fig. 2). Its close relative S. himantioides was isolated twice, once on a rotten floor of spruce wood in a farmhouse and once on spruce flooring in a multistory building in the city. Antrodia spp. grow on coniferous wood and destroy mainly wood in roof frames and ceiling constructions, as was the case by A. xantha and A. sinuosa. A. serialis appeared in the floor in cellars, and A. vaillantii in wet rooms. In some churches in Styria, this fungus infested the wood of pedestals from pews. Gloeophyllum spp. occurred in roofs, windows and door constructions, as well as on wood on terraces and balconies. While G. sepiarium and G. trabeum were more frequently found in attics, G. abietinum preferred window and door frames. True to its name, locations of the cellar fungus Coniophora puteana were mainly cellar walls and floors, above all those with contact to the earth. This fungus was rarely found in attics or on ceiling beams. The only finding site of C. marmorata was a brick floor in a cellar in Graz. Donkioporia expansa infested heavily soaked parts of floors and beams in old buildings, producing white rot. Besides the five most common genera of wood-destroying fungi in Styria, many other fungi were identified, as shown in Table 1. They occur mainly in ceiling beams or on floors of single-family houses and apartment buildings. In such a manner, specific genera of wood-destroying fungi may correlate to certain parts of a building: Coriolopsis, Peziza, Resinicium, Tapinella and Trametes occur in floors, Rhodonia, Trechispora and Trametes in wooden walls and beams, Pluteus in cellars. In wooden attics or on ceiling beams, the following wood-decaying fungi were found: Penidiella, Phylotopsis, Resinicium, Pestalotiopsis, Rigidoporus, Schizopora, Scytalidium and Talaromyces. Leucogyrophana pinastri has grown in two buildings on the spruce floor in a castle and on the basement ceiling of a farmhouse. Leucogyrophana mollusca was discovered in an alpine wooden house on floors and walls. The data of this study offer a first overview on the distribution and spectrum of wood-destroying fungi in Styria, but it is by no means comprehensive. “Dry rot” was first mentioned in 1765, when devastation of construction wood became a serious problem (Singh 1999). Some of the wood-destroying fungi were transported from one country to another through timber imports (Weir 1919). Because S. lacrymans has the highest destructive potential and occurs quite frequently, this fungus is in the focus of most of the studies concerning wood-destroying fungi. According to the Austrian national heritage agency (Bundesdenkmalamt), up to 200 renovation cases are reported every year in Styria. S. lacrymans is widely distributed in Styria and up to now, 397 reports from different regions exist. S. lacrymans occurs more frequently in mountainous regions and in the city of Graz than in the hilly southern regions. The hot spots of S. lacrymans in Germany are North Rhine-Westphalia and the cities Hamburg and Munich (Buchwald 1989). In Finland, 110 wood-destroying fungi (59% S. lacrymans) were diagnosed between 1978 and 1984, and 116 cases between 1985 and 1988 (43% S. lacrymans) (Paajanen and Viitanen 1989). During the period of 1996–2002, S. lacrymans was the most frequent wood-destroying fungus in Latvian buildings with 46.7% (Irbe and Andersone 2009). In a study by Pilt et al. (2009), 633 damage cases were reported in Estonian buildings between 2002 and 2008. In these cases, S. lacrymans was also most frequently isolated (502 cases, 79.3%). Second was C. puteana (7.0%), followed by Antrodia spp. (5.3%) (Pilt et al. 2009). In Norway the most commonly found brown rot producing fungi were C. puteana (16.3%) and S. lacrymans (16.0%), whereas in Finland Antrodia spp. were more prevalent (Alfredsen et al. 2005). In the present study, 40 different species from 74 genera of wood-destroying fungi were identified in Styrian buildings. This is, compared to Estonia with 16 species, quite a high number. The sum of 35 species of wood-destroying fungi was reported from 1428 building investigations in Norway (Pilt et al. 2009; Alfredsen et al. 2005). Schmidt (2007) described 80 wood-destroying basidiomycetes that commonly occur in German buildings. The dry rot fungus S. lacrymans, on the one hand, is able to adjust to the environment, therefore it is present worldwide, but on the other hand, it needs specific parameters to survive and grow in buildings (Maurice et al. 2011). It can be found in Europe as well as in cold regions in Asian countries. Engh et al. (2010) have found significant genetical differences between European and Japanese isolates. Genetical data led to the conclusion that the evolutionary origin of S. lacrymans is in the Himalayas (Kauserud et al. 2007; Skrede et al. 2011). Kauserud (2004) demonstrated the occurrence of geographically widespread vegetative compatibility groups in S. lacrymans in Europe. In a recently published review by Gabriel and Svec (2017), the authors report S. lacrymans to be the most abundant wood decaying fungus in the following European countries: Poland, Germany (both former FRG and GDR), Belgium, Latvia, Finland and Estonia, and the second most common in Denmark, Norway and Romania. S. lacrymans has also spread over New Zealand and southern Australia (Thornton 1991), as well as over central and northern America (Watkinson and Eastwood 2012). According to Palfreyman (2001), S. lacrymans has not been reported from tropical countries. The distribution of S. himantioides is unclear in many places. It was recorded from central and northern Europe, northern Asia, northern America, southern Australia and New Zealand (Kauserud et al. 2004, GBIF 2017). In France, S. himantioides is often in close association with D. expansa (Pottier et al. 2014). In contrast to S. lacrymans, S. himantioides grows in nature and only rarely in buildings (Maurer et al. 2014; Palfreyman et al. 2003). In the present study, S. himantioides was found in a farmhouse and in a multistory building in the city. Maurer et al. (2013) have reported on the occurrence of this fungus once on a disposed spruce board and once on a board in a stream bed. Two species of Serpula, namely S. lacrymans and S. himantioides from Himalayan forests, were first successfully cultured and identified in 1997 (White et al. 1997, 2001). Investigations of more than 5000 damage reports in Germany have shown that all wooden structures in buildings can be a substrate for wood-destroying fungi when the wood is not protected properly (Schmidt 2007). Areas of particular interest are the implications of wood-destroying fungi on buildings with different construction methods, softwood and hardwood timbers, and location of the damage site. On average 0.4 damage cases per 1000 inhabitants were reported in the present study in rural areas and small towns (Styria without Graz) but 1.0/1000 inhabitants in the capital Graz (Table 5). This above-average accumulation of wood-destroying fungi, above all S. lacrymans, in the city of Graz, may be explained by the fact that Graz suffered from massive damages by aircraft bombs during the “Second World War (WW2)”. In 57 bombing raids between 1939 and 1945, a total of 7743 buildings were destroyed or damaged in Graz, 8999 apartments were made unusable and 11,065 apartments were damaged. In total, 3707 tons of bombs were thrown on Graz, almost 2000 people (1% of the population) died, and an estimate number of 1500 people was injured (Brunner 1989). Consequently many damaged buildings remained exposed unprotected to all types of weather for years, before reconstruction began, mostly without antifungal preservation. Furthermore, fungus-infested construction wood was most likely brought as firewood into undamaged buildings. For many buildings in Graz, where S. lacrymans has been found up to the present, bombing damages during WW2 are documented. According to Huckfeldt et al. (2011), S. lacrymans mostly occurs under floor boards, in the ceiling or under poorly sealed bathrooms or leaking pipes, but infrequently in attics. The authors reported S. lacrymans both in new and old buildings. In the present study, this fungus was found mostly in old buildings (88.4%). In new buildings, the incorporation of moist or infested wood or inadequate drying out of buildings can lead to the development of damages caused by wood-destroying fungi. In this study, S. lacrymans was found in floors in 46.6% of cases. In a Norwegian survey, S. lacrymans was responsible for damages in the floor in 17.0% and in walls in 17.1% (Alfredsen et al. 2005). The second most frequently isolated wood-destroying fungal genus was Antrodia. A. serialis infested cellars and wooden floors (garden hut), A. sinuosa preferred roof beams in old buildings, and A. vaillantii chipboards in new buildings. In Styrian monasteries and churches, A. xantha was found in roof frames and beams. The wooden ceiling of an indoor swimming pool was also subject of damage by an Antrodia species. In Europe, the most common species of Antrodia is A. vaillantii, which occurs preferably in spruce wood (Schmidt 1994). A. sinuosa is found in Europe, northern America and Australia on coniferous wood (Schmidt 2010). Antrodia was the most frequent genus of fungi in Norwegian roof beams (17.3%), in roof and wall constructions (28.6%) and in exterior constructions (Alfredsen et al. 2005; Gabriel and Svec 2017). A. serialis was only found sporadically in buildings from other countries (Schmidt 1994). Maurer et al. (2009) discovered A. serialis in the montane, subalpine region of Styria. The yellow pore fungus A. xantha was found on windows, swimming pools and flat roofs (Schmidt 1994). Gloeophyllum comprises three important wood-destroying species, which are found widespread in Europe, in North America, northern Africa and Asia. G. abietinum is the most common species and prefers the wood of spruce and fir. In the present study, it was mostly found in urban areas on outdoor wooden constructions. This is consistent with findings from other studies where this fungus is described as common destroyer of weathered hardwood constructions, when sufficient moisture and warming sunlight is present (Pfabigan 2011; Schmidt et al. 2002). G. abietinum occurs in northern regions, and frequently destroys wooden windows, whereas the quite rare G. trabeum is commonly found in the south and prefers deciduous wood (Schmidt 1994). According to Plank (1979), G. odoratum is connected to spruce wood, G. sepiarium also grows on fir and pine wood, which is commonly used as construction material. Molecular and biological investigations proved the occurrence of G. trabeum, G. abietinum and G. sepiarium (rusty gilled polypore) in buildings in Germany (Schmidt et al. 2002). These three species are important destroyers of wooden windows and are often found in the attics of buildings. In the present study, these three Gloeophyllum spp. were found as well. G. abietinum was isolated in a higher number from windows and doorframes, as well as from balconies and terraces, G. sepiarium was present on wood in the exterior area of mountain huts, on terraces, fences and roofs in urban buildings, and G. trabeum on wooden constructions in the roof, on floors and in wet areas. G. sepiarium was found in Norwegian buildings in floors (1.5%), in walls (1.9%), in roofs (6.0%), on window- and doorframes (1.9%), and mostly in external areas of buildings (13.2%). G. trabeum was not reported from Norwegian buildings, but in Finland, this species was found together with G. sepiarium, the former mainly in saunas and from roof beams (Alfredsen et al. 2005). The increase in Gloeophyllum spp. in Denmark was traced back by Koch (1991) to the fact that window and roof constructions are often deficient (Schmidt 2010), others claim that the rise of G. sepiarium on window frames is a consequence of the introduction of thermo-windows (Alfredsen et al. 2005). Coniophora is present in Europe with 12 species, of which five are regularly found in the environment (Huckfeldt and Schmidt 2015). The wet or cellar rot C. puteana is by far the most frequent species within this genus. C. puteana occurs mainly in new buildings, but also in old buildings, it can spread over the whole object, from cellar to roof (Grosser 1985; Schmidt and Huckfeldt 2011). This fungus proliferates in moist walls with cracks, occurs under boards in kitchens and bathrooms but can also develop outdoors on masts, poles and windows. In Denmark and Romania, C. puteana was the most commonly isolated wood-destroying fungus in buildings (Gabriel and Svec 2017). This fungus was also present in walls (14.4%), on roofs (11.3%), on window and door frames (15.5%) and in external constructions (19.8%) (Alfredsen et al. 2005). C. puteana was also found in historical buildings on “Deception Island” in Antarctica (Held and Blanchette 2017). In the present study, Coniophora spp. did not occur in historical buildings. Sterflinger (2010) described C. puteana together with S. lacrymans in churches, when wooden altars or roofs are defect. Of the other species, only C. marmorata was recorded once in a cellar floor of an apartment building in this study. In Denmark, C. marmorata is found quite frequently in buildings after water leakage. Krieglsteiner (1991) documented C. marmorata for former Western German States. C. prasinoides, which was reported in Germany on a floor of spruce wood by Huckfeldt and Schmidt (2013), was not found in the present study. Donkioporia expansa is not as well-known as other wood-destroying fungi, but its occurrence in Germany and Austria is gaining in importance. In Europe, there are reports from England, Czech Republic, Slovakia, Belgium, France and Germany. It was declared „important wood-destroying fungus in buildings” between 1990 and 1999 (Kleist and Seehann 1999; Bobekova et al. 2008). D. expansa prefers moist to wet wood, decays hard- and softwoods by white rot and is found consequently mainly in wet rooms as kitchens and bathrooms (Kleist and Seehann 1999). Pfabigan (2011) reported on a case of damage due to massive dampness in the ceiling below a kitchen and a desolate shower. This fungus occurs mainly in coniferous wood, but it can also infest the duramen of oakwood. (Schmidt 2010). Investigations indoors show that other wood-destroying fungi are involved as well. Many species are also found in Styria, and the occurrence of some of them is documented in the database for fungi (Dämon and Krisai-Greilhuber 2012). The genus Leucogyrophana prefers wooden farmhouses and floors in historical buildings in this study. In Norway, Leucogyrophana holds 3% of the total number of wood-destroying fungi (Alfredsen et al. 2005). L. pinastri, found under boards during a survey, was even blamed to be the cause of an extrinsic allergic alveolitis (Stone et al. 1989). L. pulverulenta causes brown rot and occurs regularly in German buildings with earthy, wet substrates (Huckfeldt et al. 2011). The distribution range of Fomes fomentarius corresponds widely to the appearance of deciduous trees. In the present study, it was found in an attic. Fomitopsis sp. may destroy wood when stored improperly (Rayner and Boddy 1988; Schwarze et al. 1999). In this study, Fomitopsis pinicola was isolated from a floor. F. pinicola grows on hard- and softwood in all regions in Styria (Maurer et al. 2014). F. pinicola was also isolated from buildings in Estonia (Plank 1979). In Italy, it was found only outdoors (Saitta et al. 2011). Rhodonia placenta, which was introduced from North America, appeared in the present studies once in a wooden hut made of spruce timber (Findlay 1967). An infestation of the floor and the thermal insulation with wood chips in a new timber frame building by R. placenta was reported from Germany just a few years after residents moved in (http://www.holzfragen.de/seiten/rosafarbener_saftporling.html). R. placenta is very common in North America and serves as a model organism for brown rot decay mechanism and comparative genome analysis (Gaskell et al. 2017). Tapinella (Paxillus) panuoides is also present on coniferous wood. It grows on bridges, balconies, garden furniture or together with S. lacrymans in cellars, stables etc. (Schmidt 1994). In the present study, T. panuoides was found in the cellar of a farmhouse, and T. hirsuta in the attic of a single-family house and in the ceiling of a rectory. Tapinella spp. are not only present in Styria but also in the neighboring federal state of Carinthia (Sperdin 1976). Wilcox and Dietz (1997) described the prevalence of Rhodonia placenta, T. panuoides and other wood-destroying fungi on freshly cut wood. These fungi were possibly brought into the wood during processing or after flooding (Heidegger-Kastenhuber 2007). 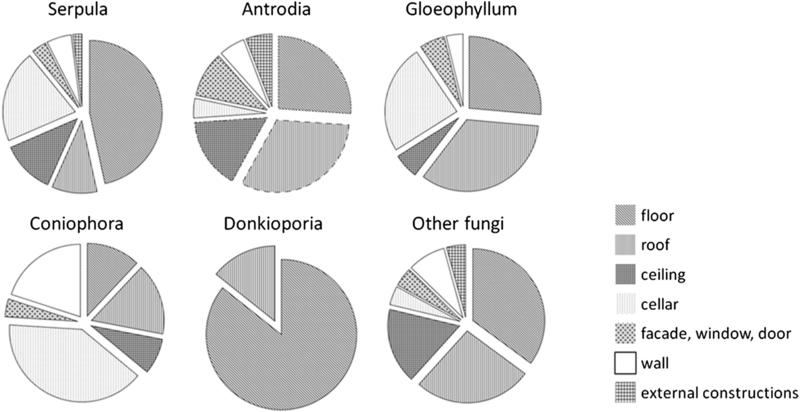 In Europe, the genus Trametes is represented by nine species (Tomsovsky et al. 2006). Trametes spp., above all T. trogii, are residents of deciduous wood in moist riparian forests, also in Germany (Kreisel 1962). Whereas T. trogii was found in the present study in wall- and ceiling constructions, T. abietina was isolated from the roof of the wet zone of a sauna. T. trogii was also found in Graz in the floor of a new building. The ochre crust fungus (Crustoderma dryinum) was discovered first in southwestern Germany after a water damage (Grimm et al. 2016). C. dryinum was also reported sporadically from Scandinavia, France and the Austrian federal state Tyrol (Dämon 2001). In the present study, it was identified only once on the wooden ceiling of a house with water damage. Species like Stereum hirsutum, which may infest older and weakened trees, can also be introduced into buildings (Blinkova and Ivanenko 2016). Cease et al. (1989) discovered Scytalidium sp. in the wood of a birch and confirmed the interaction between Scytalidium sp. and brown and white rot fungi. In the present study, Scytalidium lignicola grew in an attic and a ceiling. Polyporus spp. were found sporadically in a wooden ceiling, floor and roof terrace, Tapinella panuoides in the bathroom of a single-family house, Resinicium bicolor in the floor of a single-family house and the attic of an apartment building, and Trechispora farinacea in a wooden ceiling and on incorrectly stored timber. Wood-destroying fungi in buildings are present in all regions of the federal state of Styria, with a prevalence for buildings in the urban area and properties constructed before 1945. The most common species is the dry rot fungus Serpula lacrymans, which is found in all types of buildings and in all Styrian regions. 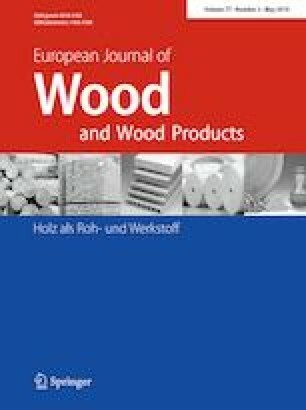 More work and above all active cooperation and networking between scientific institutions and commercial companies focused on wood-destroying fungi in buildings must be done to increase the knowledge in this subject. Open access funding provided by Medical University of Graz. We are grateful to the late Prof. Dr. Helmut Salomon, whose extensive and meticulous collection of cases of wood-destroying fungi in Styria was the cornerstone for this paper, which we would like to dedicate to him.